The recently refurbished apartment Zeemist is located in a quiet complex. You have your own, south facing, garden (with garden fourniture). Very relaxed with a snack or a drink. Ideal for a family with 1 - 2 children and a dog. On the frontside of the complex is a large common courtyard garden with picknick tables, a children's playground and bicycle storage. Around the complex there is free parking. The apartment is cozy and comfortable. You have everything you need for a pleasant stay during your holiday. Larger groups, as for example families or friends, can rent also the above apartment Zeevlam. Or apartment Zeewind with sunny balcony on the south-west side. In the southfacing garden, which is completely fenced, it is lovely to have your breakfast, aperitif or just relax with a good book. Ideal for small kids, you can let them play – with peace of mind. In the front the apartment is also adjacent to a courtyard. Here you can also sit and let the children play. The owners created a relaxed atmosphere in this apartment. The living room has a dining table for 4 persons, a sofa bed (120x200) with flat screen TV. The open kitchen provides ample closet space and is fully equipped. The beautifully bathroom has a rain shower and sink. In addition to the bathroom is a separate toilet. In the bedroom is a double bed. Zeemist is a lovely place to come home after a day on the beach or at the Zandvoort racing track. But perhaps you prefer a long walk along the high dunes, dune lakes or a bike ride along the many estates that Zuid-Kennemerland counts. 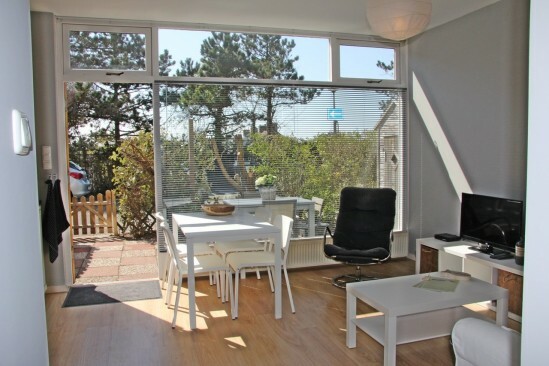 Zeemist is just a 3 minutes´walk from the dunes, a 5 minutes´ bike ride to the beach,15 minutes´ bike ride or a 10 minutes´ car drive from the historic center of Haarlem. For people who love shopping, it's good to know that Haarlem is the best shopping city of the Netherlands. You like to go for a day trip to Amsterdam? This metropolitan city is also close by. Questions about Apartment Zeemist 338?